The morning started with a pleasant surprise as the hotel staff kindly washed our bikes for us. we gladly gave the chap who washed them a healthy tip as a result. The boarder crossing was only a couple of hundred meters away from our hotel making an easy start. Steve had to educate the local Nepalese customs guy on how to complete the Carne paperwork, after which it was a simple case of getting through immigration and off to India. Once in India we had to do the same thing again before we were allowed to proceed. The process was a fairly quick, only taking 2 hours to complete the crossing. Shortly after we got underway it started to rain very heavily which certainly makes for hard going. Typically we simply don’t bother with wet weather clothing as the temps are so high its easier to just get soaked and hope to dry off as if the weather eases. 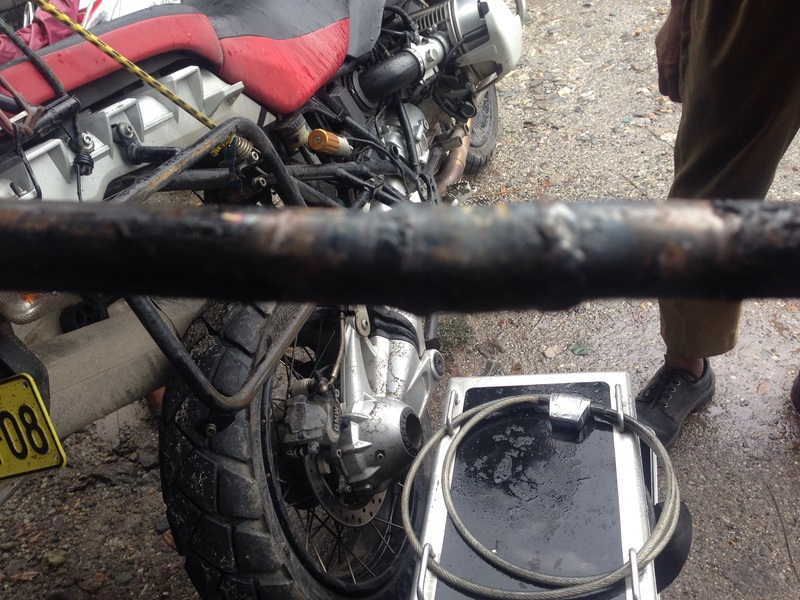 I noticed that a support strut on the rear of Steve’s bike had broken and was hanging down. The strut was part of his pannier frames and was critical to their support. 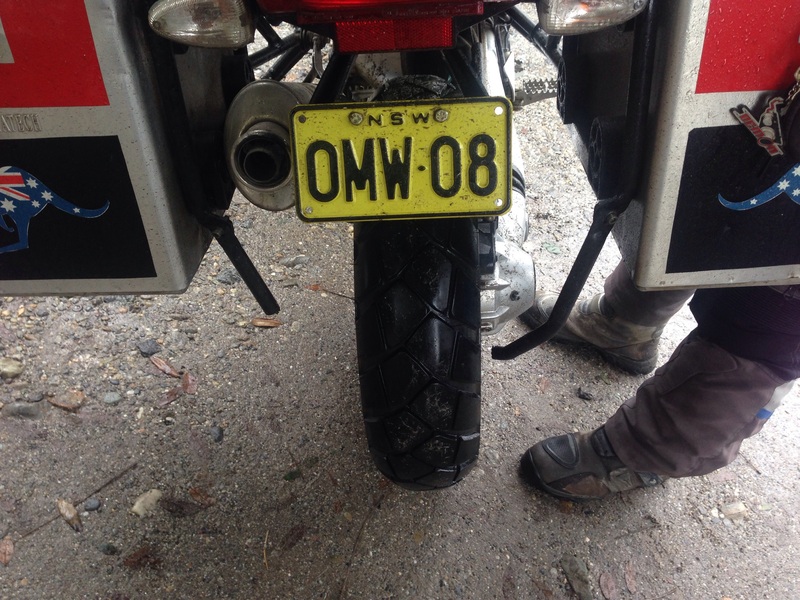 I flagged him over and we then had to work out how to get it fixed. Fortunately an old traffic cop was standing by and took Steve with the broken part off to a local firm and 1/2hr later they were back with it nicely welded and ready to refit. We were soon back on the road and the rain had not stopped. We were now faced with extremely dangerous traffic conditions due huge pot holes and buses and trucks swerving into our path to avoid them. At one point while riding behind Steve I witnessed him having to drop his right shoulder in order to miss being hit by an oncoming bus! One other incident that occurred was a car pulling out in front of Steve which was an extremely concerning moment. This resulted in a heated discussion with us explaining to the driver, the errors of his ways. It was after this we decided to get off the roads early as we spotted a hotel and headed straight for it. The hotel staff were very obliging and made every effort to assist us in drying our clothes. We were glad to be off the road and dry at last. Chitwan to Kakarvitta was a distance of 481km and was pretty straight forward. We had approx 80km of rough road to start but then it opened up to good sealed roads. 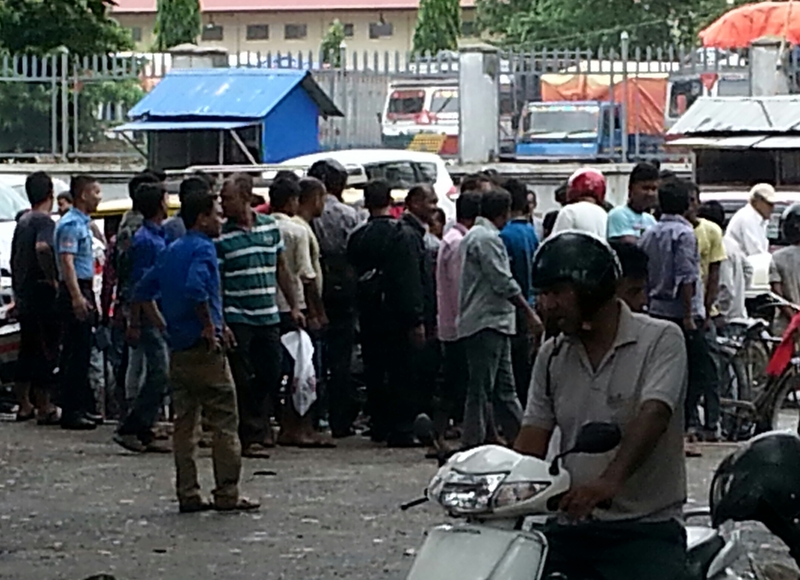 There had been several riots and a strike in the region over the past days causing a lack of supply to petrol stations and due to the strike those that may have had fuel remained closed. This was now causing a problem for us. After searching for around 80km;s we came across an open station, the problem was approx 200 other motorcycles had arrived before us! This would have meant an hour or two of queuing but thanks to the local police we were quickly ushered to the front of the que and allowed to fill our bikes. 50 litres of fuel and we were sorted. Both Steve and I felt rather sheepish for being allowed to the front of the que, we quickly scampered off before anyone could say anything. The temps were low 30’s early but cooled down in afternoon which was a pleasant change especially as you become more weary. Kakarvitta is the town on the boarder with India and we located a reasonable hotel that also had a casino attached. No locals were allowed in the casino so it was full of Indians who come over the boarder to gamble, get drunk and then stagger back home penny less. The casino was not out thing so we left after a quick tour. It had rained really heavy over night with significant thunder and lightning making us wonder what our day was going to be like? Fortunately the rain had all but cleared and Day 2 of our Chitwan Natioanl Park adventure was taken up with a walk in the morning with our host (Sahodar) who did a great job of explaining the local Chitwan culture and history. Chitwan people first settled here after moving north to avoid the ongoing battles with Mongal tribes many centuries ago. Another interesting fact is that the local Chitwans had become to malaria due to their diet (including drinking rice wine) and coating themselves in an ancient treatment. The local houses were simple mud brick huts and in more recent times using concrete if you are one of the “well off”. All properties were supplied with electricity and were charged a minimum of 80rp per month which allowed for a simple light to be run. Later that morning we were given an educational talk on elephants, which included feeding them their specially prepared food they require. 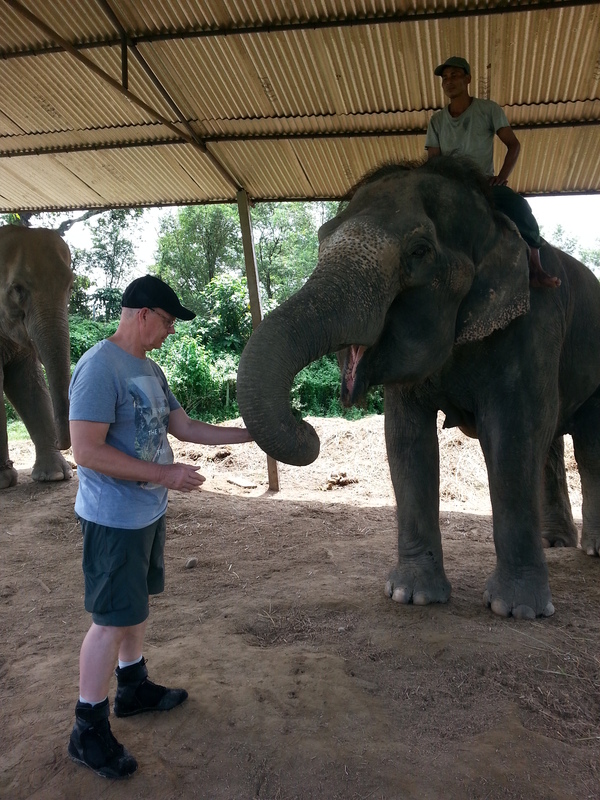 Steve and I both took the opportunity to feed these magnificent animals showing them the respect they deserve. Unfortunately due to lack of funds they still used shackles to restrict the elephants movement which is something we highlighted to the park needs to stop. We later were shown a trial being funded by the WWF organisation that used a simple electric fence to contain the animals in a larger free roaming enclosure. Let’s hope this is a success and is rolled out more broadly. Later that afternoon we were taken on a canoe ride down the Rapti river in locally produced wooden craft which took in observing crocodiles along the banks. We then Walked through a section of the jungle to a crocodile conservation facility which was set up in the early 1970’s. On the walk back to the river we were forced to “sneak past” a rhino that was just ahead of us in the elephant grass. We were only about 20m away from this huge creature. This was truly amazing stuff for Steve and I, especially when the guide calmly pointed out tiger foot prints bigger than a grown mans hand in the sand! What was more concerning was that our guides were only armed with a large pole about 2m in length. I made a joke that I only needed to be the second slowest runner should a tiger attack which went down with a reserved laugh (don’t know why). The guides were taking their jobs very serious and on a couple of occasions we were asked to be quite! 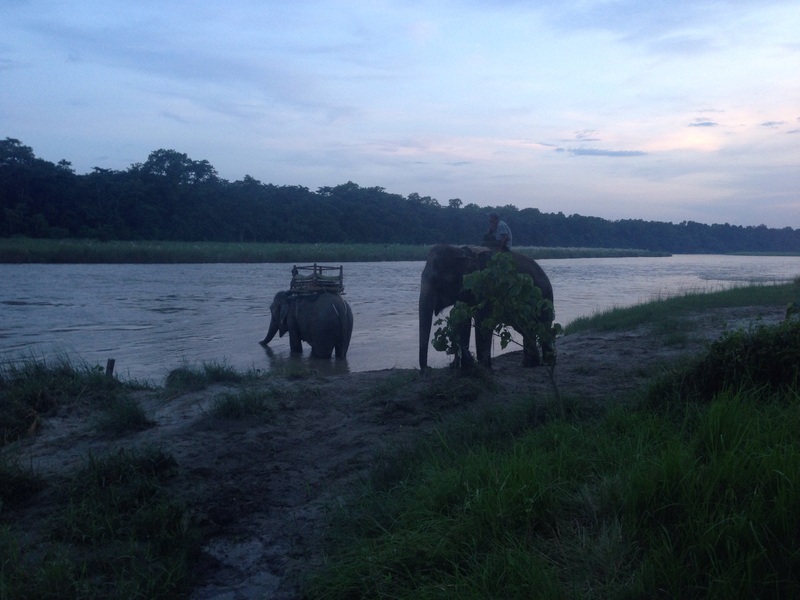 Elephants chilling out in the river after an amazing ride through the Chitwan National Park. Our journey today will take us from Kathmandu to Chitwan Natioanl Park, which is a UNESCO recognised world heritage site. Something to really look forward to. First we had a ride of 165km out of Kathmandu and heading west at first and then dropping south to the park. The roads were heavily eroded in sections making the riding dusty and rough in stages, thankfully the bikes are ideal for covering distances and taking in the rough sections all I their stride. Arriving midday at Jungle resort located on the banks of the Rapti River alongside the Chitwan National Park we were greeted by the lovely staff who had lunch ready for us shortly after arrival. We were the only guests in this resort, which was partly due to the season however unfortunately since the earthquake tourists had simply stopped coming which is very sad for the community that rely on tourism as its main source of income. At 4:00pm we were off on an elephant ride through the park which ran for nearly 3hrs. To ride atop elephants and seeing animals such as Rhino’s, Spotted deer, Hog deer, Monkeys and a Crocodile was something we shall never forget. Apparently Tigers and Leopards also roam free in this jungle, although are endangered species due to hunting in the past. It is a credit to the staff of the park and the army that now guard the Chitwan that no poaching deaths have been recorded of animals in the past two years. Let’s hope this continues. The evening was a relaxed time spent chatting to the staff of the resort and sneaking a cold beer which went very well with the locally sourced and produced dinner. A lay day in Kathmandu meant updating the blog after such a long spell without Internet access. As part of the stuff that goes on behind the scenes when undertaking an adventure such as our Mad Ride, is planning and booking the coming days and weeks ahead for such things as visa’s, sites to see, routes, weather reports, accommodation, finances, bike requirements and not to forget the washing and updating our blog. Previously we had advised our Myanmar guide (a Myanmar visa requirement) that we were expecting to arrive at the boarder around 7th September, however it was now evident we will make the boarder approx 5 days early. We had been attempting to change the start date of the leg but due to the Myanmar beurocrisy this was now not looking possible causing us to reschedule our coming days. 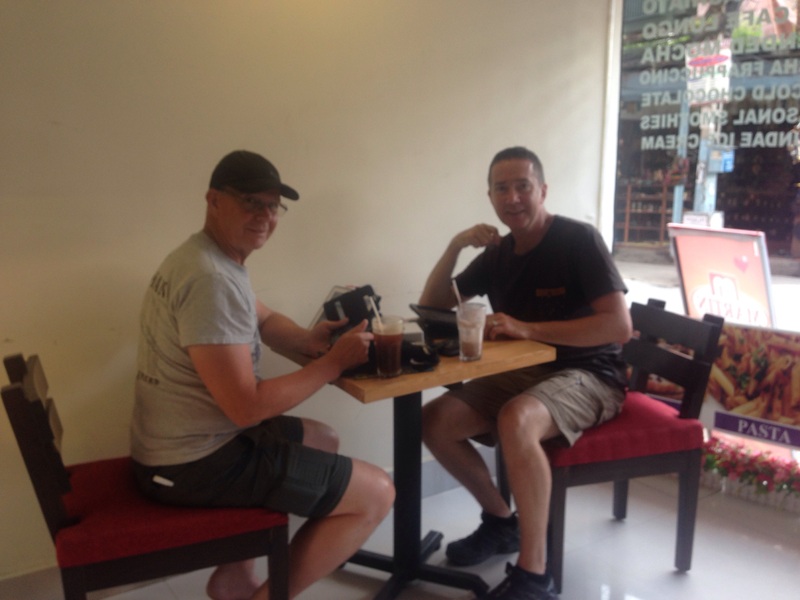 Steve took on the task of coming up with the change in schedule and I sat down and worked on the blog, as it was the first time we had acceptable Internet connectivity since leaving Turkey. The day was spent bashing away on my iPad in a local cafe and Steve investigating and booking a wildlife safari tour with a local travel agent. Maybe not the most exciting day but a productive one, none the less. Tomorrow we are off to Chitwan Natioanal Park. 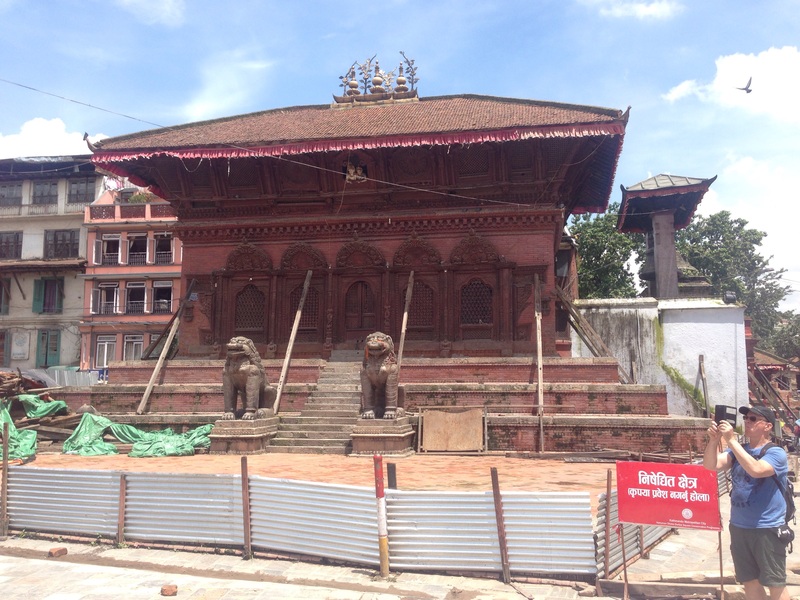 This is the Monkey temples high up on a hill in Kathmandu and has suffered due to the recent earthquake. After arriving yesterday in Kathmandu it was time to get out and explore the sites of the city. Although the capital city of Nepal it was great that the pace was still not as manic as we found in the typical larger Indian cities. It made getting about somewhat less stressful. 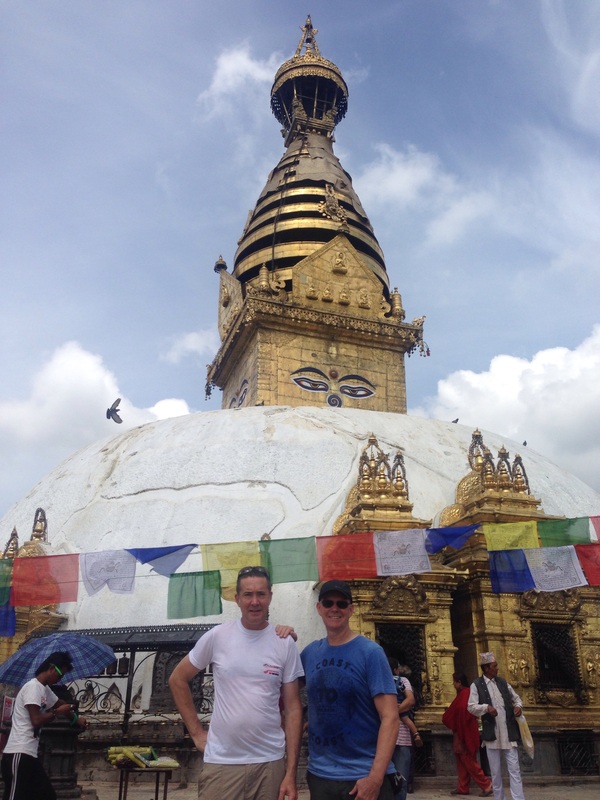 After a 2km walk we arrived at the Swayambhunath (aka Monkey Temple) which has the large gold topped temple as the centre piece and various shrines surrounding it. This Buddhist religious temple is ancient, however in recent years has suffered due to a lightning strike and the earthquake earlier this year. There are 365 stairs on the approach to the temple (one for each day of the year) making getting there a serious task due to being on such a steep hill. The resident goats and monkeys did not seam to mind however. 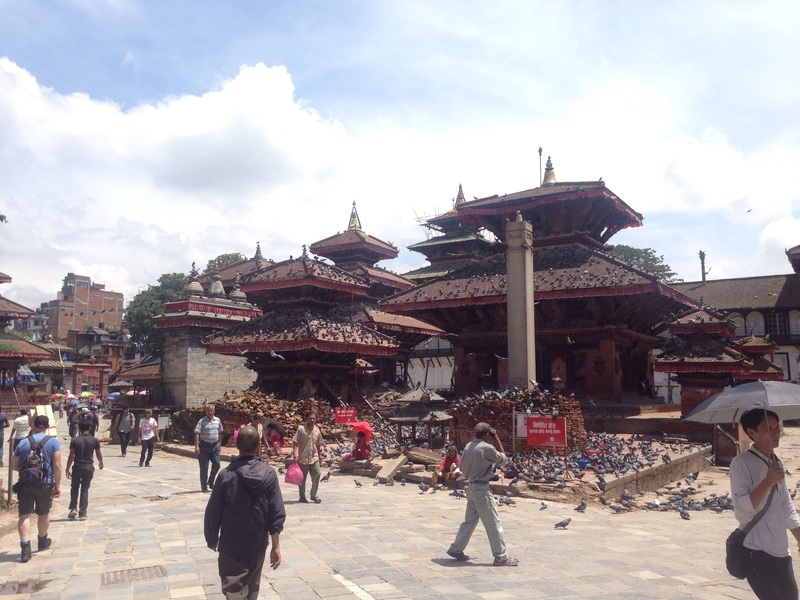 Next we were off to Durbar Square which many of you may have seen in the news reports following the earth quake. This part of town is full of buildings that are considered UNESCO world heritage sites and it is such a shame to see the damage that occurred on that faithful day on 25 April of this year when the major earthquake hit this area. Hopefully in time and a lot of hard work many of these buildings will be returned to their former beauty. The final stop off for the day was to visit Shree Pashupatinath Temple which is a Hindu temple and burial place, located along the banks of the Bagmati River in Kathmandu. To see bodies being cremated in open view and the grief families are going through when saying good by to their loved ones was quite confronting. 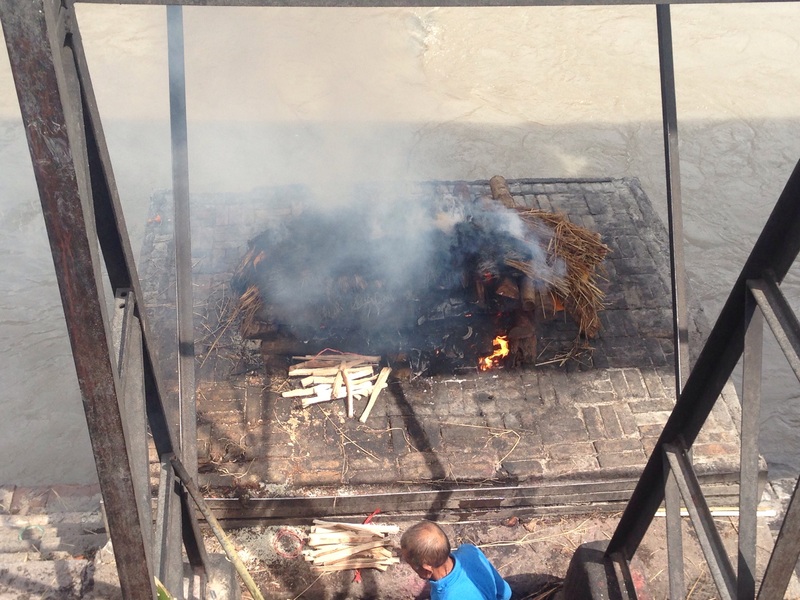 The cremation process takes 4hrs and afterwards the remains are tipped into the river alongside where the process takes place. After bodies are tipped into the river, children jump into the river and try to retrieve an jewellery the deceased may have been wearing! Odd but true. We had enjoyed Pokhara and this morning we left to make our way to Kathmandu. 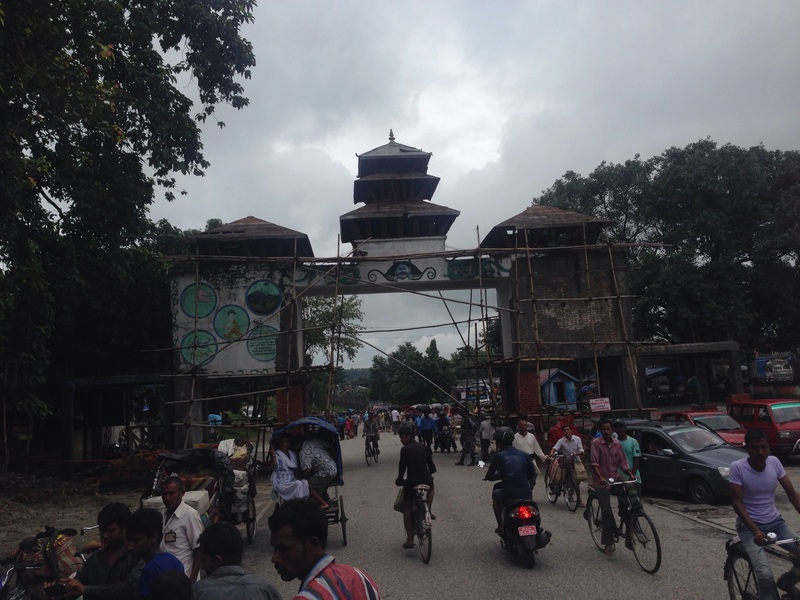 Upon leaving Pokhara we got to understand the real size of this city as we we staying at “lake side” which had a very different feel to the commercial side of the city which we found ourselves navigating. The commercial side was exactly that, busy, more people and stuff happening. The ride was very pleasant except for the pollution from the trucks. At one point we encountered a severe traffic jam as we negotiated a mountain pass which caused problems for the bikes getting very hot due to lack of progress and high ambient temps. 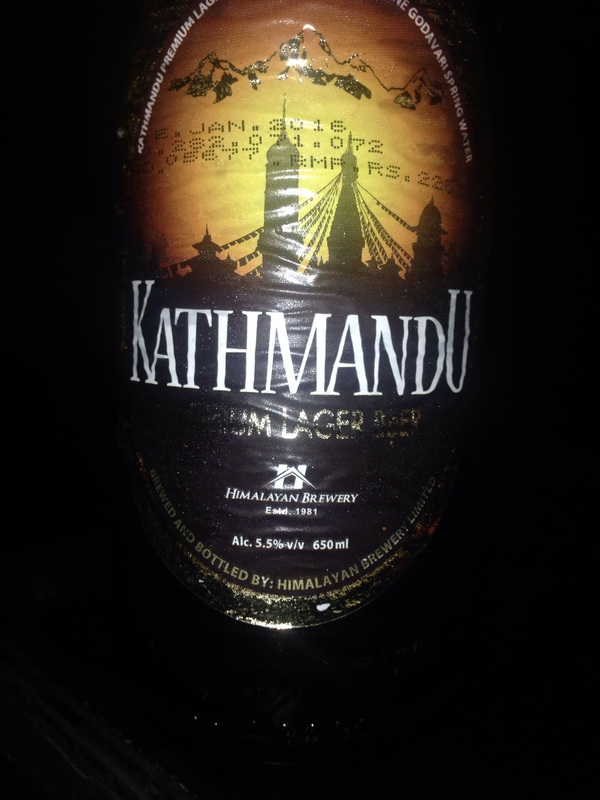 We finally made Kathmandu, time to celebrate! We made it into Kathmandu and the GPS thankfully negotiated the small streets of the city well, taking us to the hotel we had arranged to stay at that night. Steve had unfortunately dropped his bike as we were making our way in traffic as he put his left foot down which went into a hole allowed the heavy bike to tip and go over. Fortunately no injuries or damage, but just a big effort for us both to lift the 280kg BMW upright once more. The day finished with a well earned beer and a walk to get accustomed with the area. 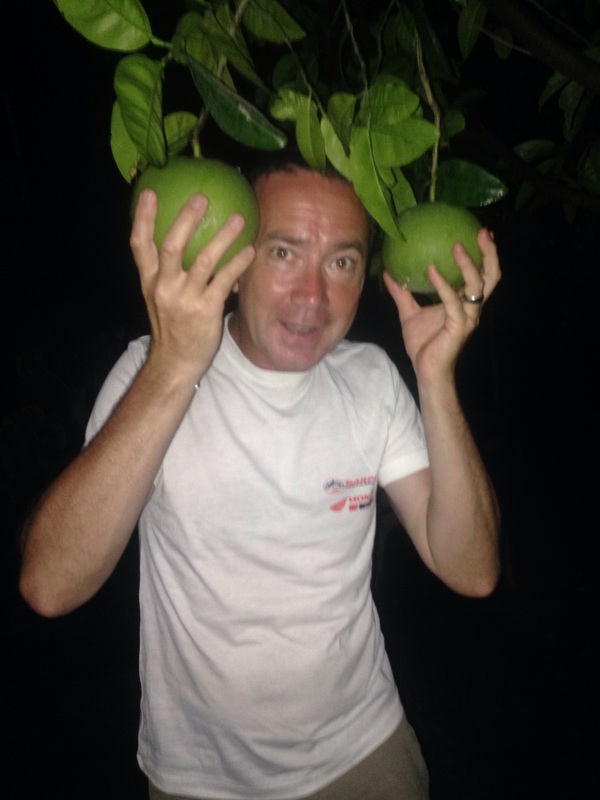 Although these looked like apples we were advised they were a type of lemon? For all those “insurance people” it amazing what you see in Kathmandu! 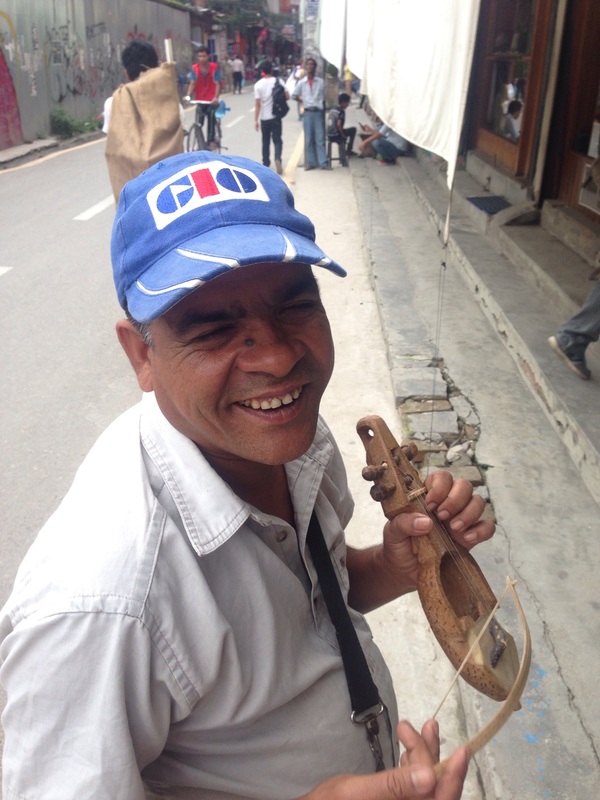 busker with a GIO cap.